Zhen Gu in his lab on NC State University's Centennial Campus. 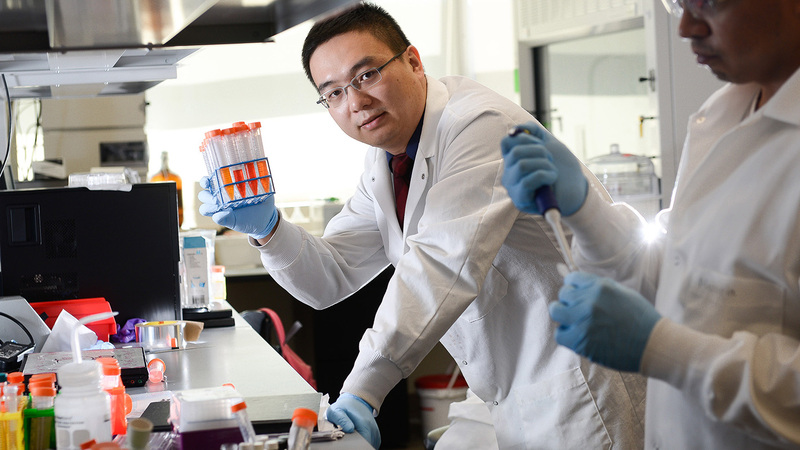 Zhen Gu, an assistant professor in North Carolina State University and University of North Carolina at Chapel Hill’s joint biomedical engineering program, has been named one of MIT Technology Review’s “Innovators Under 35” for his work on developing novel drug-delivery systems for treating cancer and diabetes. “It is very exciting to be recognized for my innovation and passion for using science and technology to help people and – hopefully, eventually – to both improve people’s quality of life and save lives,” Gu says. The annual list, which Tech Review has issued since 1999, was created to highlight exceptionally talented young innovators from around the world in a variety of fields. Previous winners include Facebook cofounder Mark Zuckerberg and Google cofounders Larry Page and Sergey Brin. Gu joined NC State and UNC-Chapel Hill in 2012, and has since created dozens of technologies and techniques aimed at delivering the right drug to the right place at the right time to maximize the impact of therapeutic medications. Gu’s work is truly interdisciplinary, drawing on biomolecular engineering, materials chemistry, nanotechnology and other fields in his efforts to develop more effective drug delivery tools and techniques. Gu’s research on regulating insulin in diabetic patients was recognized by the American Diabetes Association earlier this year with $1.6 million in funding under its Pathway to Stop Diabetes initiative. Gu’s work on diabetes includes the development of a “smart insulin patch” and multiple injectable nanoscale systems that can help to regulate insulin. Gu is currently working with pharmaceutical companies to move these inventions into clinical trials. Gu has also developed a suite of new approaches for targeting the delivery of anti-cancer drugs directly to tumors. Gu has created nanoscale “daisies” and graphene “flying carpets” that deliver anti-cancer drug cocktails directly to cancer cells. The graphene flying carpets also have mechanisms that deliver each drug to the specific part of the cancer cell where it will do the most damage – as does another technique he developed that uses so-called gel liposomes. Gu’s lab has also developed “nano-cocoons,” nanocapsules and a delivery system activated by the presence of the “energy molecule” ATP, all of which have ways of tricking a cancer cell into absorbing them before triggering the release of the anti-cancer drugs – like tiny, anti-cancer smartbombs. While these techniques are not ready for clinical application, Gu plans to launch a startup company to commercialize his technology. “This award is extremely encouraging, and energizes me to continue to find new ways to help people live longer, healthier lives,” Gu says. MIT Technology Review, owned by the Massachusetts Institute of Technology, creates technology-related editorial content on a variety of platforms for an audience of millions of business leaders, innovators, and thought leaders, in six languages and in 147 countries. I think this is so inspiring! More new cancer treatments will be carried out very soon. Dr. Gu! Your creative approach is so inspiring to all of us that we may continue the hope for the day that cancer is cured. Thank you for all your efforts and may you continue to be successful and inspire more efforts by all of us to work diligently for the Good of Mankind. Congratulations Dr. Gu! May you find a way to stop Cancer before this decade ends. Your accomplishments also encourage and energize all Asian/Asian American students/staff and faculty in our NC State campus community. Congratulations! Hope a more effective cancer treatment will be resulted from your research. I pray that you will come up with a way to stop Cancer. To many of my family and friends are affected by Cancer. Keep up the good work.